With the cooler weather I have been thinking of the delicious spicy cooking of Saras Rao’s Curry Corner in Hayward, but she is much in demand and since I can never remember to call my order in early enough, we were turned down when we called at 4:30… We decided to try Pakwan, a few doors down, in the same quiet strip-mall. 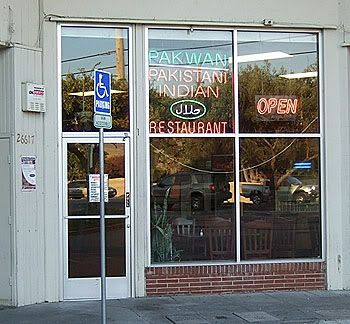 Pakwan is a small chain with two other locations in San Francisco and one in Fremont, specializing in Pakistani and Indian cuisine. The facilities are huge and cavernous in stark contrast to Curry Corner’s cramped, narrow quarters. As I approached the imposing stainless walk up window manned by a grumpy man with little patience for indecisive newbies, I noticed that there is no motherly hand holding going on here. We ordered to go and I stayed there while Mr. K went back to retrieve Ika, our cat, from the nearby veterinarian. While I was sitting there waiting I could see that they have a very brisk take-out business. 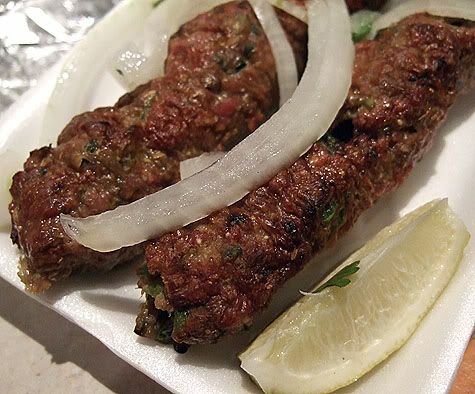 Over the years I’ve heard a lots of good feedback about the Pakwan in the Mission so I was excited to find one so close to home. 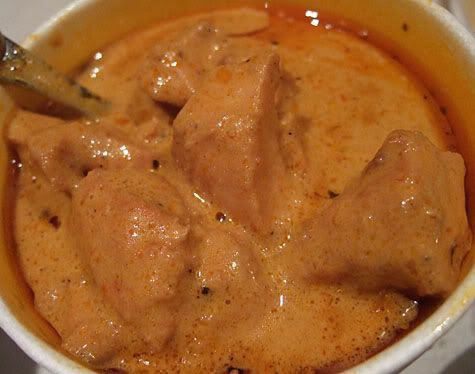 We know and love Murgh Makhanwala, Butter Chicken, so we started off with that. It is dark chicken in a tangy, rich buttery tomato based sauce that simply explodes with flavour and is delicious spooned over rice or scooped up with naan bread. 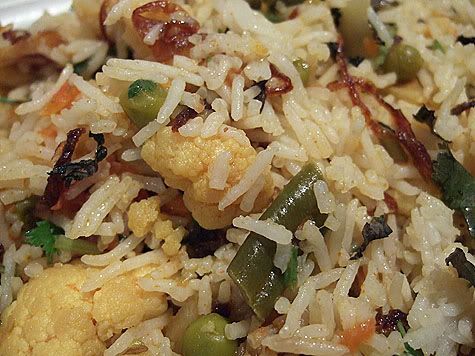 I wanted rice to go along with the butter chicken, and the cashier suggested a Biryani, which we agreed to, but I would rather have just had plain white rice to tell the truth. This dish should be treated more as an entree as it was quite complex tasting with a lot of different ingredients. It was greasy and heavy which didn’t really enhance the bright ringing flavors of the curry sauce… and it was literally swimming in oil. Strangely enough, as we had originally thought that we would be getting our dinner from Curry Corner, Mr. K had purchased some sort of Mediterranean flat bread at our sadly lacking neighborhood grocery store, because he prefers naan bread to the roti that Saras Rao serves. Since we had a large bag of the flat bread, we did not order the naan from Pakwan. I have since learned that they make some of the best naan around, which is a shame because the stuff we got from the store was dry and needed to be resuscitated in the toaster oven. 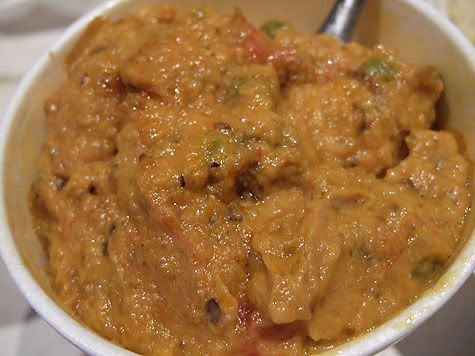 The Bengan Bharta is a rustic Eggplant dish that is baked first then cooked with onions and tomatoes then seasoned with a variety of aromatic spices. The texture was light and fluffy yet thick enough that it could be eaten with a fork. It was milder than the other dishes and was good with the chutneys spooned in.